Oby Edozieh Alex O shared super-cute pictures of her son, Prince Alex O. The little prince looks happy and healthy. Prince will turn 4-Month-Old on the 22nd January. Prince with this beautiful smile will sure be a ‘head-turner’. Famous Nigerian Musician Shows Off His Family Picture – Spot Him!!! 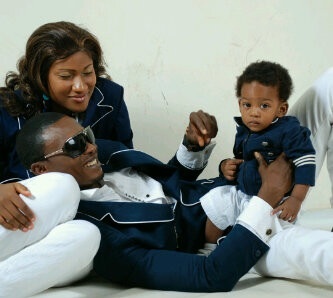 Which of the Nigerian musician can you spot on the above family picture. Among the four kids sitting on the front roll is one of the Nigerian famous musician Bracket. Take a close look and tell us which of them you could see on the picture. This is your favorite writer Delia Innoma. See me see wahala! I was just frying these fish that I bought from the shop, suddenly the fish turned to a human faces figure. These fish are very scary. Is this real or just my imagination? This is my true story no joke!!! We couldn’t stop laughing! Too funny! Lol. Please help us title this picture!!! Lol! Heidi Klum takes her parents on shopping!!! At first I thought “what was she doing?” Like seriously! Rihanna was caught urinating in a public place. The big question is “who snapped this picture? ” lol! now you know!!! One of the richest man in Africa Alhaji Dangote, looks so simple and humble. On the right is Psquare’s father, whom obviously was at his son’s wedding. We are yet to see the rest of the family or are they still stuck in Ghana??? Lol. Congratulations to the couple. Mike Ezuruonye visited Mercy Johnson and her daughter. Nice pose!!! Halloween conjures up all kinds of scary look. Americans will spend nearly all their life-savings on Halloween costume and masks we know, but why…? We can’t help but wonder “why he chose this look? Really scary!!! Thank God is only Halloween mask. Lol! Please help us title this picture!! !